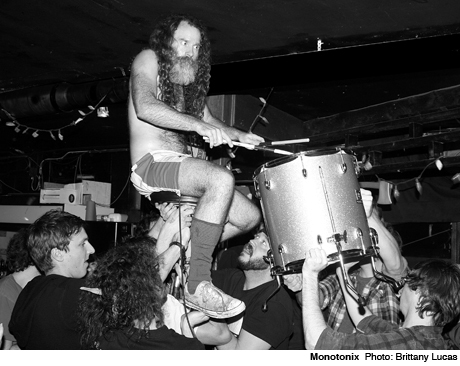 Though the garage rock world is obviously fraught over news that the White Stripes have been put to pasture, we can all take solace knowing that Israeli rockers Monotonix are still among the living. Despite reports earlier this week hinting at the hirsute showmen -- known just as much for rubbing their sweat-soaked bodies on audience members as for their fuel-injected guitar riffs -- were calling it quits, a statement from the band claims things aren't as bad as they seem. Singer Ami Shalev told an Echo Park, CA crowd last week (January 27) that the band's current tour would be their last, but reports since then have toned down the melodrama. It seems as if the group, who have literally played hundreds and hundreds of gigs over the last couple of years, just need to take a break. Honestly, those guys probably need some time to re-juice. Reports that they are breaking up are a little exaggerated... What's really going down is Haggai, the drummer, has a kid on the way, and Ami wants to spend some more time with his family, so this will be their final tour for a while. But they are not looking at it as the end of the band or touring for good. Just an extended break to focus on the other parts of their lives. So while they may not be calling it a day, it sounds as if Monotonix will be taking some significant time off after this trip, so catch them while you can. You just never know when you will next have the chance to have a man comprised of 80-percent body hair rub himself all over you. Well, at least in a concert setting. Monotonix "Before I Pass Away"